The Sixth Trumpet is the Second Woe. It occurs just before the Seventh Trumpet which brings about the end of the Great Tribulation. A war of this magnitude will disrupt food, water, electricity and medical supplies all over the world. There will be changes in the atmosphere and nuclear fall out. No continent will be spared. When the Seventh Trumpet sounds, the Church will be raptured. Then God will pour out His wrath on the Nations who are left behind (the third woe). 19Then I saw the beast and the kings of the earth and their armies gathered together to wage war against the rider on the horse and his army. 20But the beast was captured, and with it the false prophet who had performed the signs on its behalf. With these signs he had deluded those who had received the mark of the beast and worshiped its image. The two of them were thrown alive into the fiery lake of burning sulfur. 21The rest were killed with the sword coming out of the mouth of the rider on the horse, and all the birds gorged themselves on their flesh. 11Then I saw a second beast, coming out of the earth. It had two horns like a lamb, but it spoke like a dragon. 12It exercised all the authority of the first beast on its behalf, and made the earth and its inhabitants worship the first beast, whose fatal wound had been healed. 13And it performed great signs, even causing fire to come down from heaven to the earth in full view of the people. 14Because of the signs it was given power to perform on behalf of the first beast, it deceived the inhabitants of the earth. It ordered them to set up an image in honor of the beast who was wounded by the sword and yet lived. 15The second beast was given power to give breath to the image of the first beast, so that the image could speak and cause all who refused to worship the image to be killed. 16It also forced all people, great and small, rich and poor, free and slave, to receive a mark on their right hands or on their foreheads, 17so that they could not buy or sell unless they had the mark, which is the name of the beast or the number of its name. 18This calls for wisdom. Let the person who has insight calculate the number of the beast, for it is the number of a man. That number is 666. 13And it performed great signs, even causing fire to come down from heaven to the earth in full view of the people. The Beast out of the Sea? The Day of the Lord. Christ will pour out his Wrath on those who persecuted his people. False Christians will go to Hell. Do not worship the Beast or accept his Mark. The woman is the False Church, the Great Prostitute who sits upon the Beast. Woe to those nations who persecute God’s people. 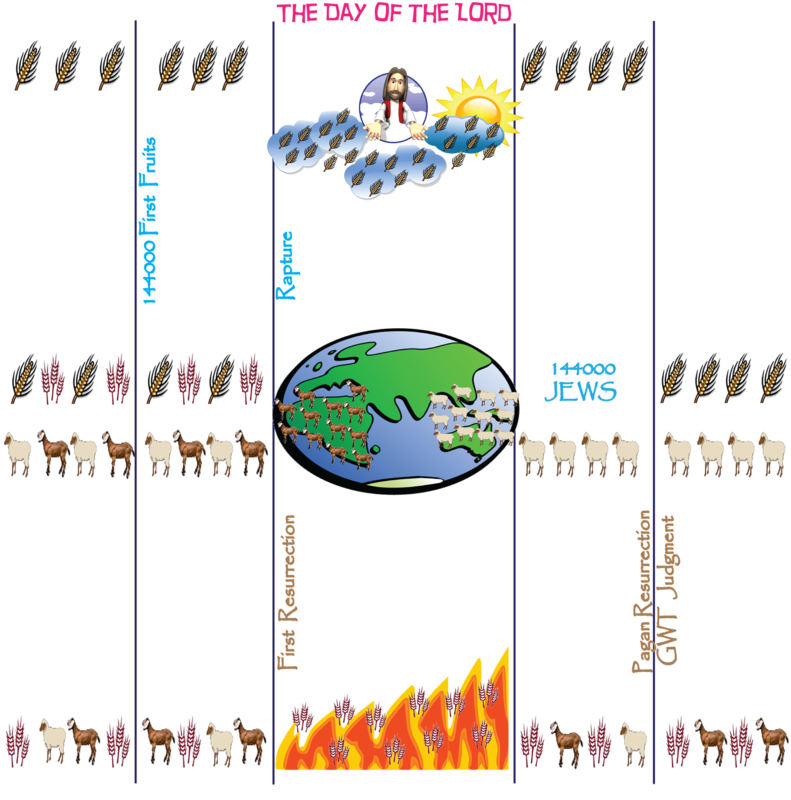 The Nations will be separated into the Sheep and the Goats according to how they treated God’s people. Nigerian Christians murdered by radical Muslims. God will punish the Nations who persecute his Children. God will separate the Nations into the Sheep who were kind to His people and the Goats who persecuted His people. The Goats will spend Eternity in the Lake of Fire.